Calling for SCBLA Member Involvement! WE NEED YOU! Happy New Year and I hope each of you started the new year off with a bang! Speaking of a bang, SCBLA wants to start 2018 the same exact way. As a part of our 2018 vision, SCBLA seeks valuable input from each of you. So, we decided to start the ball rolling by asking and seeking our members to assist us to fill 16 openings for judicial circuit representatives to the SCBLA Executive Committee pursuant to our Bylaws. How do we plan to accomplish this goal? I am glad you asked! Please find attached the 2018 SCBLA Judicial Circuit Representative Nomination form. If you or any member are interested in serving as a judicial circuit representative, please complete the attached form and return to: SCBLA_Sec@comporium.net. 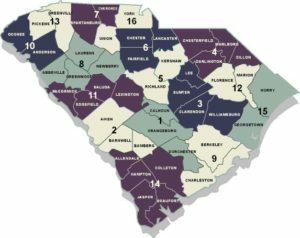 Also, attached for your convenience is our SC Judicial Circuit map to assist you. Likewise, the 2018 SCBLA Judicial Circuit Representative Nomination form may be found on the SCBLA website at www.SCBLA.com. Please encourage our fellow lawyers, who may not be members, to join and get involved with SCBLA. So, I implore each of you talented and amazing SCBLA members to help SCBLA meet one of its 2018 goals by nominating yourself or another SCBLA member to serve as a circuit representative. Thank you in advance for your support and we sincerely look forward to receiving your forms in response to this call to serve.